Branson's second indoor waterpark is an intimate offering, consisting of a lazy river and an interactive kiddie play area. There are also two slides for riders of at least 42 inches in height. There's a twisting corkscrew body slide and an innertube slide. There is a large outdoor component to the park, open seasonally. As of the summer of 2010, the resort was selling day passes for non-guests for $15 per person. 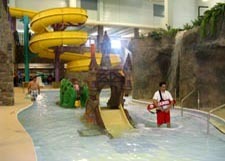 The waterpark is naturally included at no cost to overnight guests of the resort.